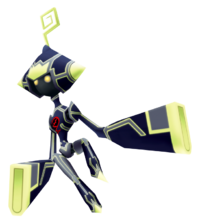 The Strafer is an Emblem Heartless that is found in Kingdom Hearts II. They are small and relatively weak, but they tend to swarm and use electric attacks, like most of the digital Space Paranoids Heartless. Later, they are sent to Hollow Bastion by the Master Control Program through the use of the Heartless Manufactory. When Sora and his friends first arrive in Space Paranoids, Sark orders some Strafers to imprison them. Later on, Sora and the gang must defeat Strafers in order to collect Clusters and freeze the monitors in the Dataspace. When Sora returns to Hollow Bastion and finds that the MCP has taken over the town's defense system, the MCP creates Strafers and other Heartless to attack him. The Strafer is a thin, mechanical, humanoid Heartless made of black material covered in thin, yellow circuitry. Its head resembles that of a Shadow, being a black sphere with glowing, yellow eyes. It wears a diamond-shaped helmet with an angular, curled antenna connected to its top. Its upper arms are quite thin, while its forearms are wide and flat. Its legs are much shorter than its arms, and the Heartless emblem is emblazoned on its chest. Strafers move in a jerking, robotic manner. The Strafer's name is derived from the word "strafe," which can mean both "to move sideways without turning" and "to attack with automatic gunfire." This is how the Strafer fights; it strafes around its targets and fires at them. Its Japanese name, "Eraser," may reference de-resolution, the erasure of a computer program, and something Sark threatens Sora and his companions with. Strafers are very weak, both in offense and defense, but there are often many of them at a time. Look out for the energy rings they fire. These move slowly, but have a homing ability and can do some damage. Physical and magical attacks work well against Strafers, but any Thunder magic will heal them. Since they are very weak, they should not be a problem.